The mixing of races in Saint Domingue occasioned a plethora of commentaries, mostly venomous and polemical, on the causes and consequences of the colony’s multiracial order. 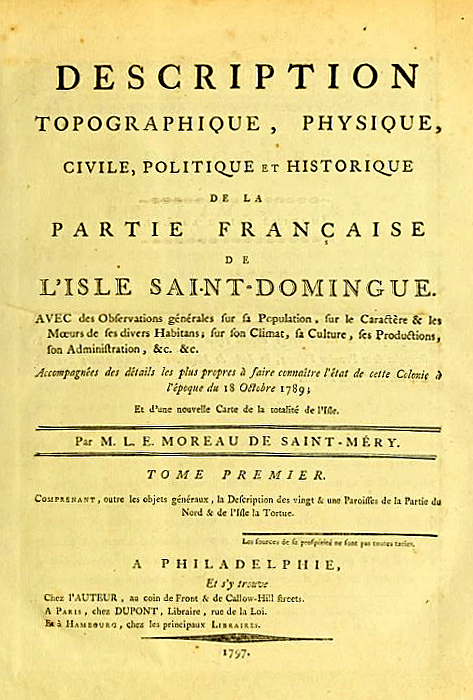 The most famous of these commentaries, though not the most polemical, was by Moreau de Saint-Méry, the colonial jurist and historian whose writings on Saint-Domingue are still a major resource for contemporary scholars. In volume one of his Description, Moreau counted and categorized 11 racial combinations in the colony. He argued that ancestry should be traced back seven generations and hence ultimately comprised 128 combinations. The “science” of skin color received one of its earliest formulations in this work, completed in 1789. Moreau was himself the father of a mixed-race child by his mulatto mistress.